Continuing our cushy tour of Ethiopia, we flew from Lalibela to Axum, a stones throw from the Eritrean border. The afternoon was spent finding a hotel and then digging into bomboloni and coffee. Lent was still in full swing and we continued our battle to find meat, settling for vegetarian dinners. Our day touring historical Axum saw us visit twenty to thirty metre tall stele, ancient stone monuments towering into the clear blue skies. Underneath these lay tombs of 16th century kings, though many still lay undiscovered. We did our Indiana Jones best and snuck through some restricted doors, only to be greeted by ancient walls. Venturing into the hills above town, past the bath of the Queen of Sheba, we were rewarded with scenic vistas and more royal tombs. We trudged back to town in the heat, only to eventually find our that the museum we were both looking forward to was either closed or ensconced inside the Church of St Mary. We aren't sure which, but either way we didn't see it. That afternoon we had every intention of seeing more royal ruins, but instead went back to the hotel and fell asleep for several hours. The next day we flew to Gonder, cruising low over the amazing Simien Mountains, truly stunning landscape. 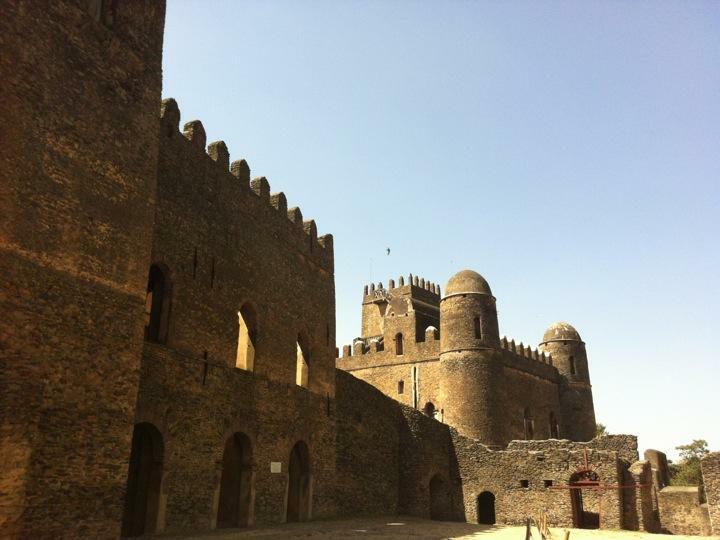 The afternoon beer turned into a rooftop session overlooking Gonder's Royal Enclosure, and bed beckoned. The morning after saw us wander about 16th and 17th century castles that wouldn't be out of place in a European fairy tale, as the remnants of the Gonderian royalty wowed us. Some of these ruins were in great disrepair but others were in amazing condition considering the whole place was bombed by the British and Italians at one point. Amazingly they kept lions here until 1992! We walked from here to King Fasiladas' Bath, a royal holiday house set in the middle of a giant pool. Both of us agreed we wouldn't mind residing here. In the afternoon we hiked across town to the Church of Debre Sellassie, but weren't allowed in as it was Good Friday. Blasphemy followed. During the day the church opposite our hotel had engaged in obscenely loud chanting being broadcast over a p.a. system. We were told it wouldn't last all day, and were relieved when it stopped in the late afternoon. We had a lovely dinner at Four Sisters Restaurant, a definite recommendation to anyone visiting Gonder, and bunked down early as we had to be up at a reasonable hour to catch a bus. The night turned bad when at midnight the chanting came back, louder than ever, and continued until morning. Sleep was not forthcoming. Our arranged minibus dropped past at 8, and it was a fairly uneventful trip despite being shuffled to a smaller, worse vehicle halfway through the drive. Bahir Dar, on the shores of Lake Tana, was breezy and hassle free compared to the constant child-beggars of Gonder. A hotel room near the lake shore was our base for a boat ride out to the island monasteries. Despite paying less than everyone else on the boat, as much as a quarter of the price one poor passenger had forked over, we still felt affronted when asked to pay more than three times as much as some locals to access monasteries and churches. While by this stage we are more than used to racially based price discrimination, this was a bit much. We relented and paid entrance to one monastery, marveling at the seven hundred year old, goat skin texts, and colorful pictures, but the other places visited we skulked around the outside, peeking through cracks in the bamboo walls. We also had the chance to visit the source of the Blue Nile, as unimpressive as the White twin! Lucky they get better later on. A day and a half of relaxing lakeside will see us back to Addis, and our time is rapidly ticking away in Africa.